Google Finance Portfolio Discontinued. Our Alternative Portfolio. Free Custom Stock Portfolio Spreadsheet? Google Finance is killing their portfolios feature, in the next week or so. In typical Google fashion, they aren’t afraid to remove features and move on. Seeing how Google hasn’t updated their Finance site since 2006 (! ), it’s not a surprise they are changing things up. Their biggest rival, Yahoo Finance, has been making plenty of modern UI updates – not for the better though. However, as part of this updated experience, the Portfolios feature will no longer be available. To keep a copy for your records, download your portfolio now. To give you time to download and consider alternative services, this change won’t happen until mid-November 2017. There’s plenty of people looking for a Google Finance portfolio alternative or just a straight out replacement. Unfortunately there aren’t many free alternatives out there. If you haven’t used it recently, good. Keep it that way. Their new updates are a mess. They have reduced functionality for the sake of making it look pretty. Google Finance kept things simple and to the point. It wasn’t perfect, but it worked and that’s what I also liked about it. We don’t offer a free version at old school value (not yet anyways), but our premium product includes Google Finance-like functionality with a whole lot more. For any stock that pays a dividend, the portfolio will automatically include pulls in dividends you would have received. This is included in your portfolio return calculations. Click on the second tab on your portfolio name. I’ve just called this test portfolio “New Portfolio 2”. You can customize the table headers by selecting from hundreds of data metrics we make available. Drill down on your stocks by creating several different reports. Create a view for FCF numbers, or valuation ratios, or balance sheet related. By keeping the data results focused, it’s easier to keep an eye on your stock from a single application. Google portfolios is great, but their charts are not. With the Old School Value stock portfolio, it will calculate your portfolio performance if any transactions are entered. We use a Time Weighted Return calculation and also include equal weighted portfolio performance numbers. This shows you how the portfolio performed if all positions were equally weighted. By comparing the Total Portfolio Performance and the Equal Weighted Portfolio Performance, you can tell whether your portfolio manager is creating alpha, or whether bad allocation is playing a role. We took things a step further as we focus on making data easy to interpret. For any portfolio where transactions are entered, a summary page will be generated and updated. Here’s a breakdown of what is what. Although Google Finance is eliminating the portfolio, it doesn’t mean their entire finance site will be shut down. 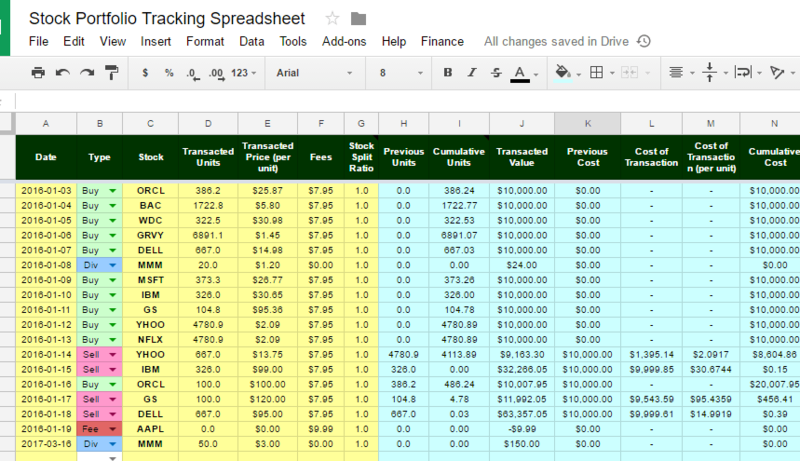 If you are looking for a free portfolio software, you can create a stock portfolio tracking spreadsheet using Google sheets. The downside is that we have no clue how long the google finance functions from within Google sheets will last. As I mentioned earlier, our portfolios feature is not a free tool. Something for the future maybe. What you get in addition to the portfolio is a suite of fundamental analysis and valuation tools to help you make quicker and better decisions. Rather than having to process thousands of data that comes flying your way from all directions, Old School Value is focused on clearing out noise and helping you focus on your analysis. If you’re after an all-in-one stock valuation and tracking solution, and believe that having the right tool for the job is important, check out the live preview of AMZN, MSFT, BAC, AAPL, FB and RHI.